Interesting thread; even more encouraging when the manufacturer responded... until they didn’t. I’ve always been interested in how the Fox body Mustang aftermarket was so enormaous - and still is - while third gens only had a fraction of options. Even more disappointing is how many of those options are no longer in production. I’ve only recently got back into a third gen after about 15 years of 4th gens and other modern LS-powered stuff. I expected the aftermarket to be stronger by this point. Hawks seems to be the only game in town for a one-stop-shop, but one certainly must pay to play. Like many of you, I don’t mind paying, but I expect a premium product for a premium price. Granted, I’m not at the rotisserie-restore point -yet- but I will be in the coming years. With that said, the majority of third gen people - in my experience - have had the tendency to be quite cheap; to be unwilling/unable to spend the money on the best. This hasn’t been lost on manufacturers, and only recently does it seem as though people are willing to pay good money for items. Personally, I’m at a much different place now than I was at 16 when I bought my first car - an 89 IROC - and I am willing to bet there are others out there like me who are starting to have some “extra money” (which I say loosely as there’s never really any extra!) and be willing to pay a premium for cars we wished we could have had in high school. I never thought in a million years I’d have a third gen 1LE, but now I’ve got one, and I’m actually racing it like it was engineered for rather than keeping it in a bubble. Who’da thunk?! My point is like many others have pointed out, we need to speak up - tactfully - and let manufacturers know what we want and that we’re willing to put our money where our mouth is. Money talks - BS walks. Give us the proper restoration-quality pieces that are being provided to other enthusiasts, and we’ll happily pay (and there will be more and more third gen people willing to pay as time quickly passes). I won't disagree with okfiz. But there are millions more Mustangs made over the years. Even when you add the Firebird and the Camaro together, the less expensive Mustang seems to have outsold them. It is all about price. Just for fun the thirty year old OE pulled off (the wrong spot) of my car and the NOS one that was tragically damaged in transit. And after my best attempt with super glue and a silver sharpie. The difference it seems between Mustang and F-body owners is interesting. You buy a new mustang and everyone on the forums will be asking you, what are you going to do to it? Are you going to mod the engine? Are you going to paint it? But you get to an F-body owner forum and there are just so many more purists, "Don't change a thing!" or, "leave it alone." The culture is just different. great point. It’s like the Mustangs are bought to beat around and race and with F-Bodies there was always an air with some folks that these would be classic cars. I knew a few people that wanted to preserve their thirdgens in a bubble even back in the 90s. I didn’t know any Mustang drivers like that. They were beating us 1/4 mile, but a lot of us didn’t care. Some of the 3rd, 4th, 5th, etc-hand owners of f-bodies that could now afford the cars are what seemed to tarnish the image.. I think that’s turning around since the inventory is relatively low and the prices are going up compared to cars of the same time. Now if if we could get all the reproduction parts quality to catch up with the trends that would be great! I just think out of the box an F-body was a better car. But for mods, the Mustang is really where it is at... Even today, I think a Camaro is a better built car than the Mustang... The biggest problem the new Camaro has is it is so uncomfortable, and near impossible to see out of. Just to bring this thread up. 1.5 years later, the manufacturer still hasn't sent me a new and improved version to examine. Maybe they don't want to be called out on their claybar residue looking like overspray. The thirdgen aftermarket is great if you want to build a pro-touring styled LSx car to blow up social media and win at autocross and amateur racing events. 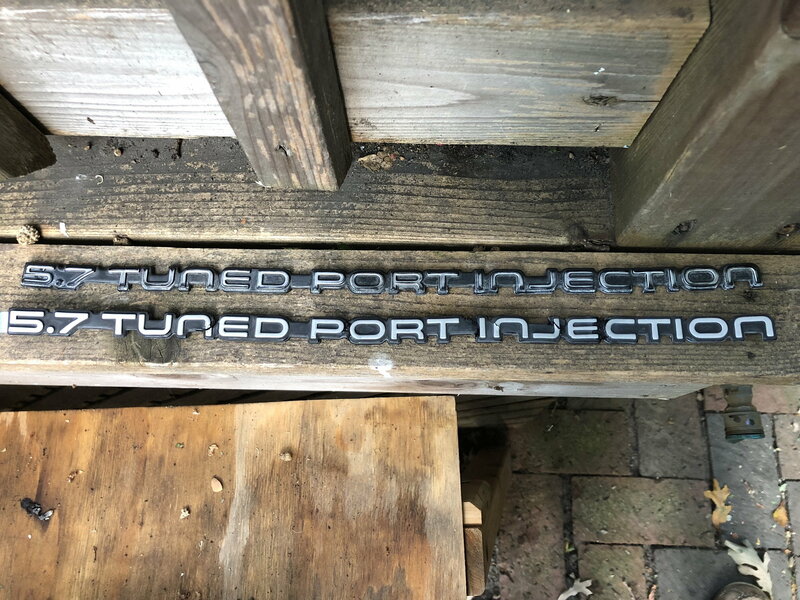 I bet if you made a LSx-styled replacement badge for the TUNED PORT INJECTION badge, it'd significantly outsell a quality TPI badge. Oh, I replaced it with a GM OEM emblem. I haven't even seen an OEM one for sale in a long time. MMM... Some fresh reproduction Gatorbacks in a modern compound that doesn't sukbauls, a BBK Turtle-Ram, and a flawless reproduction TPI badge. That'd be the life. How hard is it to remove the original emblem if cracked and attempt to glue the cracks? $100+ for an OEM one seems a little steep to me, but maybe I am cheap lol. Perhaps my question ought to be: what is the best way to remove the OE emblem without ruining it (further)? If I ever started a thirdgen repro company I think Chazman would be the quality control officer.. Believe me, they'd better be good, because I'd be a mother effer. I've done it before. It looks good and virtually unnoticeable on a driver quality car, but I wouldn't feel right on this car. Did you use a heat gun? I did. Still broke apart. Bah, crap. :/ Maybe I'll just leave well enough alone for now. Thx for reply. And I’d want them to pass the toughest test! You have shown me things I can’t unsee now..
As someone who's been at restoration of various cars of various models since 1998 I guess I'm coming at this from a bit of a different angle. I've restored cars with very little aftermarket support even though they were mega-popular when when. Case in point the 1976 Grand Prix 50th Anniversary I'm finishing up now. From 1973-1977 as many as 250,000 per year were produced. I think the Monte Carlo and Cutlass Supremes of the same era were built in the same volumes or higher yet very little is reproduced now for them. So, when I went to spruce up the interior of my 1987 IROC I was very happy to find MANY parts available repro and even some NOS available yet at semi-reasonable prices like seat belts for instance. On a more popular model, '68-'72 Cutlass\442, back in 1998 when I was restoring my first one, repro parts were much fewer and the quality was up and own. Over the years since then the quality of the repro parts may meet or exceed the originals in many case and it seems you can build an entire Cutlass\442 from the parts catalogs. I think it's just a matter of time and the F-body parts will follow with a wider variety of parts and with increasing quality. For now its a great sign that there is an aftermarket following at all. So from me, a big THANK YOU to all the suppliers making third-gen repro parts. Last edited by sshoureas; 02-04-2019 at 04:25 PM. Has anyone thought about simply making a mold from a good original? Even if you have a rough original you can putty and sand them for molding. When de-molding the original would likely be ruined for good. You could not mass produce/sell them but you could get away with making them for some of your cars. Some of you guys do have cars worth the time and effort. Simple to do. Last edited by MrPackstin; 02-04-2019 at 02:21 PM. As someone who's been at restoration of various cars of various models since 198 I guess I'm coming at this from a bit of a different angle. I've restored cars with very little aftermarket support even though they were mega-popular when when. Case in point the 1976 Grand Prix 50th Anniversary I'm finishing up now. From 1973-1977 as many as 250,000 per year were produced. I thing the Monte Carlo and Cutlass Supremes of the same era were built in the same volumes or higher yet very little is reproduced now. So, when I went to spruce up the interior of my 1987 IROC I was very happy to find MANY parts available repro and even some NOS available yet at semi-reasonable prices like seat belts for instance. So from me, a big THANK YOU to all the suppliers making third-gen repro parts. It is not the fact they are making them aftermarket, it is the fact that the aftermarket ones are not right. Might as well go to Autozone, get 13 Letters, 2 numbers and a period. It would look ok, and to most people they might never notice.. But this is for the few who know what they are looking at. There are repro parts that are on the money too.. which makes it frustrating they don’t get some really obvious parts correct..
It’s also weird that they don’t do a lot of the hard to find parts that you see a lot of people looking for with no NOS parts to be found, but the good reproduction parts they do are often pretty common place with lots of NOS alternatives (but higher prices).. There are parts where they could pretty much name their price because people would pay for the piece of mind..
Last edited by 88IROCvertZ; 02-04-2019 at 04:26 PM.